There’s a few seconds in The Passion of Lady Vendredi where I felt a line had been crossed. “Come on!” a cast member motions from the raised platform (for the whole of the Soho Theatre Downstairs served as the ‘stage’) to a member of the audience, before instructing him on what precisely he needs to do at this particular point in this immersive theatre experience. But there really shouldn’t be that level of compulsion to participate, and at the risk of sounding like an outmoded cynic, I think he should have been left alone to experience the moment as he saw fit (within reason, of course). I recall being at Madame Tussauds in London a few years back, where I had my very first experience of what is broadly termed ‘immersive theatre’. We had a briefing before entering the ‘Chamber of Horrors’ in which it was clearly explained that while actors may come ‘this’ close to visitors – ‘this’ being about an eighth of an inch away from one’s face – they would never touch us. Not here, where inhibitions are let go. At least I only had to put up with someone’s hands on my cheeks for a few seconds. Others had much worse (or much better, depending on your point of view). And while Beyoncé wanted her audiences to go “to the left, to the left”, Lady Vendredi (an alter ego for Nwando Eibizie) encourages movement in all directions, and those in the audience who could, and did, were rightly applauded and appreciated. The programme, entirely in an online format – an environmentally-friendly approach if ever there was one – is described by Vendredi at the start of the show as the ‘order of service’, and it does become clear that this is in some ways akin to a religious experience of sorts. I do not mean to say I was sat on a cold, hard, wooden pew extremely bored – quite the opposite, as it goes. Think of ‘The Rhythm of Life’ in Sweet Charity – it’s that sort of (ahem) ‘religion’, highly exuberant and passionate, if just a tad decadent. Some of the music is as repetitive as, say, the compositions of Andrew Lloyd Webber, though I hasten to add the musical styles used in this show are quite different indeed – I didn’t quite find myself listening to it with my chest, but there were moments when it came close. But I draw the comparison nonetheless as there are moments when the show drags a little as the audience waits for a song to finish before the narrative can continue. It all flows very well, however, and even the terrible jokes that occur in one scene are best understood as a parody of dud punchlines found elsewhere in the canon of theatre plays. There’s a strong feminist viewpoint in a confession scene, perhaps (in my estimation, at least) a satirical take on the Book of Common Prayer’s ‘Prayer of Humble Access’. Overall, the show is often provocative, occasionally even offensive, but never unimaginative. It’s clear from the reactions from some in the audience as certain songs began to be played by the live band that Lady Vendredi has already built up a cult following. This run at the Soho Theatre paints her work on an even wider canvas. I must say not all of us came out of The Passion of Lady Vendredi fully comprehending just what exactly went on, but it was certainly very vibrant and lively. It’s not for everyone, but it’s different, that’s for sure – I don’t think I’ve ever come across anything that even approximates to this slightly other-worldly adventure. It’s deliberately unsettling, and if you like challenging yet joyful productions, do consider a trip to Planet Vendredi. 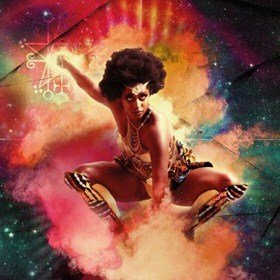 Cult music icon Lady Vendredi is a mythopoetic super heroine and vodou priestess popstar from another dimension. With an international cast and her band The Vendettas, join her on a time travelling uninhibited mythic journey and quest for revenge. This viciously beautiful and exuberant immersive music theatre production lets you gaze into the open wound of the world, where a live original soundtrack of pulsating synthetic rhythms and dirty bass drive the tensions between freedom and control, personal gods and demons, censorship and intimacy. Leave your ideologies at the door and enter an all- encompassing and experiential world of palpable sensuality, staggering insight and intriguing myth-making. Featuring tracks from the new Lady Vendredi EP, which has been supported by Floating Points, Emanative, Four Tet and Gilles Peterson, to be launched simultaneously alongside the show. What Time Is It?”>Lady Vendredi: What Time Is It?